What a nice surprise in March to be driving along a street and round a corner and come across an otherwise empty space that’s bursting with cheerfully waving daffodils buttercups narcissus paper whites yellow and white flowers of some type. Thank you, city of Tupelo, Miss. 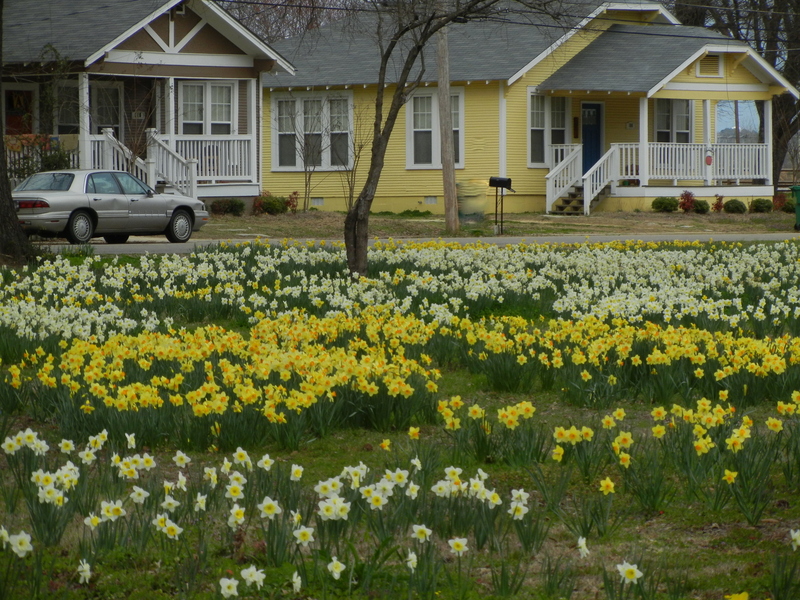 This entry was posted in Mississippi and tagged flowers, landscaping, Mississippi, spring, Tupelo by Coffee with Cathy. Bookmark the permalink. I’ve been digging up daffodils from an old home site across the creek,(where my dog got shot) and moving them to a spot between my place and the creek that belongs to the property on the other side. It’s going to look like that in a few years. Daffodils (or Daffy’s as I refer to them) are so pretty. Its nature’s way of saying Spring is here! Mary — See, you are a true gardener. Thank you for your dedication, from all of us non-gardeners! Kathleen — I love the name “daffys!” I think I’m going to use that from now on.